Three weeks ago I got a burning smell from the DC04 and noticed the belt was well worn, so replaced it and also the soleplate because the belt had worn a notch in it almost all the way through the side. Today, same burning smell is back, belt is fine, so I turned it on with the soleplate off and can see the belt moving from side to side on the roller and the soleplate has fresh rubber residue on it. Any idea what is the cause of this, the motor spindle isn't bent and is at a right angle to the motor casing. Only thing I can think of is the brush housing is worn but IDK I'm stumped. do you mean roller on motor or roller on brush bar? The brush bar is worn, you need to replace it. hmm it's only 3 weeks old, replaced it at the same time as the belt. Genuine dyson one aswell. That is strange, where the belt fits onto brush bar, what dost the profile look like? Any chance of some pictures. Ok here's a pic and vid. Not sure what the tapping sound is you can hear when it spins down. Everything is in place and together correctly, not a refurb and the metal thing is there. So, went to get a video of the belt wobbleing and it wasn't doing it, then a new issue, motors dead. Electrical smell and popping sound coming from it. Got a spare though so have swapped it out. After putting it back together the belt was wobbleing again, so got the cammera but now it's not doing it! Pivoted the brush head back and forth and then it started doing it. So it's intermittent. Is it just because the belts new and when it wears in it'll stay put? I'd agree with your original diagnosis of a worn brushroll housing. With non-obvious faults like this, sometime all you can do is swap out the parts in turn-and the housing is really the only suspect left. It'll only cost you a fiver to find out with a recycled one. I would have said a bent motor shaft, but you've already changed it. I think your right, will get a brush housing, it could do with one anyway. The only other thing I just thought of is if the belt is faulty, got a spare so might swap it. Thanks for your help everyone. Wait! :P Is there a thin metal pin on the green housing? Is it missing? Pin is there, good thinking though. What is that pin for, is it to disperse static? I wonder if because the brush bar mount on the brush housing is worn, the brush roller is sitting closer to the housing and the bristles are rubbing on the housing causing loads of extra static. IDK maybe I'm overthinking. Will get a housing anyway and see what happens. Are there rubber particles splattered everywhere? Has the belt been flapping about and catching on everything? beko, there is some on the part of the soleplate that slots in at the side of the motor spindle. 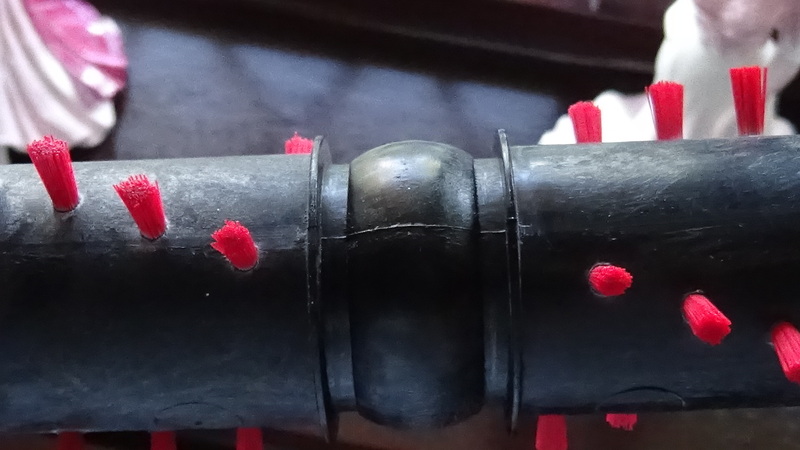 This is a new soleplate, the old one had a groove worn in it in the same place, I had presumed that was because the old belt was well worn but that can't be the case because it seems to be happening again with a new belt. Parwaz7862, If that's the case I'm supprised there isn't one on the other side aswell. Don't think there is any play in the cleaner head mount points but I'll double check tomorrow.